The incident aboard Route 359 on Nov. 27, 1998 sent the bus through a guardrail, where it landed on an apartment roof in Fremont. The gunman shot himself. 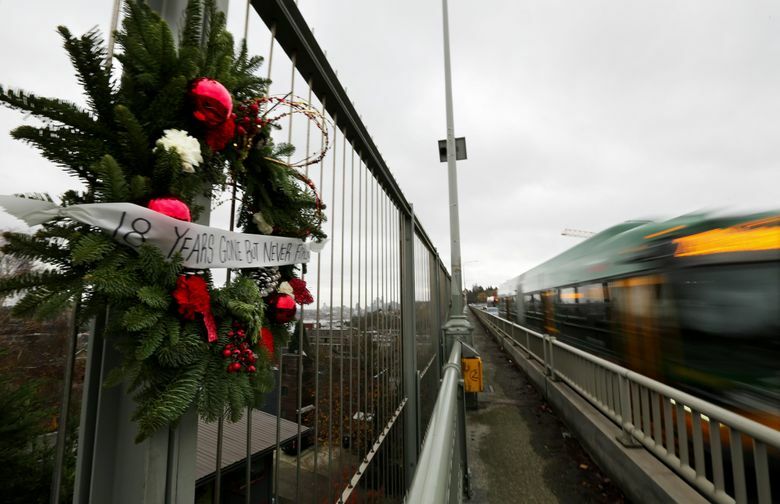 King County Metro Transit bus drivers will pause Friday at 3:20 p.m. to remember their colleague Mark McLaughlin, who was fatally shot by a deranged passenger on the Aurora Bridge 20 years ago. The incident aboard Route 359 on Nov. 27, 1998, sent the bus through a guardrail, where it landed on an apartment roof in Fremont. The gunman shot himself. Another man aboard died from medical complications, while 32 passengers were injured. The route was renumbered 358, and is today known as the RapidRide E Line, serving 18,000 daily riders. A plaque next to the bridge’s east sidewalk marks the site. Longtime bus operators still talk about McLaughlin, who was known to give bubble gum to customers. He was 44 years old and left behind two teenage sons. Ken Price, president of Amalgamated Transit Union Local 587, keeps McLaughlin’s picture on his office wall. Metro received national honors this year for reducing assaults on its drivers, yet there are still about 90 per year, typically pushing, grabbing or spitting. Washington state law defines any assault on a transit operator as a felony. Passengers will hear onboard announcements this week. Buses inside the downtown tunnel or on highways, where there is no safe place to pull over, will continue rolling during Friday’s pause in service. The day after Thanksgiving is a paid holiday, and called Mark McLaughlin Day, in the Local 587 labor contract.